Whether your Mobile VoIP business is still in the planning phase, or already well-established in the market, Telinta can help you to succeed. Mobile VoIP providers worldwide trust Telinta’s hosted Switching and Billing platform, enabling them to provide profitable Over-the-Top (OTT) mobile calling for customers and resellers. To help you easily enter the high-growth Mobile VoIP market, Telinta provides comprehensive Training on how to use our TeliCoreTM platform, live 24×7 Technical Support, plus a comprehensive online Knowledge Base to help you configure your Mobile VoIP services and more. Our brandable, customizable portals enable you to easily allow customers to perform self-service functions, check real-time call details, recharge a prepaid balance and other tasks. 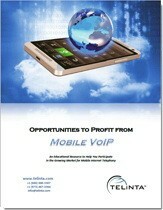 What is the first step to begin my Mobile VoIP business? Can I use my own brand? How do I buy phone numbers? What other types of services do I need? How do I find providers? Can I offer free calls between my users? How do my Mobile VoIP customers recharge a prepaid balance? What payment options can I offer? Can my Mobile VoIP customers sign up online? Telinta’s best Mobile VoIP customers come to us after using another softswitch provider who’s quality and support did not meet their needs. Many Mobile VoIP providers reach out to Telinta after trying to develop their own mobile softphone application, or trying to deploy their own switching infrastructure within their own colo space. They soon realize that purchasing and operating their own complex hardware and software is less cost-effective than a hosted softswitch solution. Telinta’s highly-trained technical staff can help you to migrate your existing Mobile VoIP business onto our cost-effective cloud-based platform. Our award-winning TeliCoreTM softswitch provides you with fully integrated Switching and Billing for Mobile VoIP, as well as a full portfolio of other hosted solutions for VoIP service providers. We offer a scalable solution, with volume discounts automatically applied, so your cost per minute drops significantly as your Mobile VoIP business grows. This means predictable monthly costs, with no surprises. How do I transition my end users onto a new Mobile VoIP solution? How can I cut my costs? How will my Mobile VoIP business benefit from a hosted softswitch solution? How do I make my business attractive to resellers? Can I use my own brand? Can resellers use their brand as well? Can my IP addresses be registered in my company’s name? ASR, ALOC and other metrics are important – how can I see them in real-time? What are my choices for codecs? Which best fits my needs? What are my costs for peer-to-peer calling between my users? How can I bundle other services with Mobile VoIP? Can I serve both iOS and Android users? How do I submit an app to iTunes and GooglePlay? Can my users download my Mobile VoIP app for free?